Our Simple Homestead/Tracy Fredrychowski/Tracy Lynn Virtual, LLC respects your online privacy. 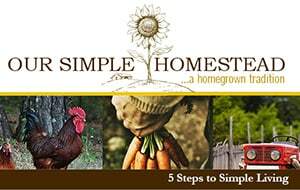 We are fully committed to safeguarding your online privacy while you visit https://oursimplehomestead.com (“website”). We use outside advertising networks and companies in order to display ads on this site. These ads may contain cookies in order to collect data in the ad serving process. These such cookies are collected by the companies and/or advertising networks, themselves. We do not have any access to this information. In order for me to support my time spent blogging and educating, I may receive monetary compensation or other types of remuneration for my endorsement, recommendation, testimonial and/or link to any products or services from this blog.